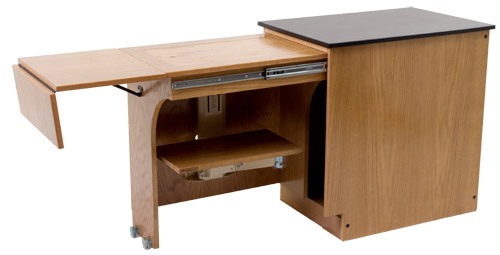 The pull-out Sewing Cabinet makes sewing storage easy and convenient. The sewing machine is stored on a spring-loaded lift mechanism that can store the machine on three different levels. The full-extension slides allow the pull-out portion to slide all the way to meet the student, and top of the unit has a solid cover to create a flat platform for measuring and cutting. Overall: 18″L x 27 3/4″W x 27 3/4″ H.